Over 35 years. That’s how long I’ve been pinning on a number in our sport. That in itself doesn’t necessarily make me a good coach or trainer, but it does mean that I’ve seen this sport as a junior, through college, as a young adult with a job, a young parent, a parent with a child who races, and into masters racing. This covers BMX, mountain biking, track, endurance racing, cross, triathlon and road racing. For those who keep score, I took a break from riding and racing for six years. I didn’t ride outside of a couple token rides each year. When I stopped, I was at well over 100 wins with a couple dozen state championships in road, track, and mountain biking. I began racing at 12y old racing BMX, and then in my middle teens I was racing on the road and in triathlons. I competed in the elite ranks of triathlon in my late teen and early 20’s, and I was a factory rider in BMX in my early teens. I also competed for my high school in basketball, football, track, soccer, etc. I’ve competed in the Olympic trials on the track as well. I took a break from riding and racing due to taking on a directing and coaching job with a pro team while still maintaining this WRA Coaching Family. We also had and have a residence program…there just wasn’t any time left in the day. Further, I was battling some health issues. All told…from lung disease, a broken neck in a bike accident, internal injuries from another, being hit by a car at 50mph, hip degeneration…I’ve taken a beating. I also had a tumor removed from around my spine in 2016. I was able to sort out some of those ailments with some aggressive strength training, which included going after (and succeeding) challenges of 10,000 kettlebell swings (53lbs kettlebell) in 8 days and doing 1,000,000 pounds of squats in four months. At the end of 2017, I renewed my racing license, set my ego aside and requested a downgrade in category, and I raced. I don’t view racing categories as a lifetime achievement award, though I fully admit I’m enjoying the process of working my way up through the upgrade process again. I’m now 48 years old in 2018, married, and I have three kids (22, 15, 14). My oldest (Noah) raced for a professional development team in Belgium. Heck, my wife, Chloé raced and won the Texas Cup in cyclocross while pregnant with our daughter. I’m a founding board member of the Texas Bicycle Racing Association, and with Chloé, we founded The Racing Post. We’ve promoted over 15 races. Cycling is a family business. My youngest doesn’t race, but he rides every day, rain or shine, and he’ll ride in the dark to keep his streak going. Simply put, this sport is our passion. These days my riding is weaved in and out of my two youngest kids who are in junior high and high school. My oldest is in college and is a USAC certified cycling coach, earning that at 18y old. My youngest kids are state level throwers of the discus, and I do workouts with them regularly. There’s also the regular busy things of school projects, homework, plays, etc. For those who race who have kids, I understand. My day job is as a full time cycling coach, and that’s what I’ve been doing since 1999. Along the way, I also spent a few years working as a director for Slipstream Sports (Garmin-Sharp), directing and coaching the development team. With my wife, Chloé, we also run a residence program for athletes who take that extra level of commitment to the extent that they live here with us full time. We also spend 3-4 months a year in Belgium and Italy, helping riders develop to the elite level and otherwise get that racing and living experience that can only be had in the heartland of bicycle racing. 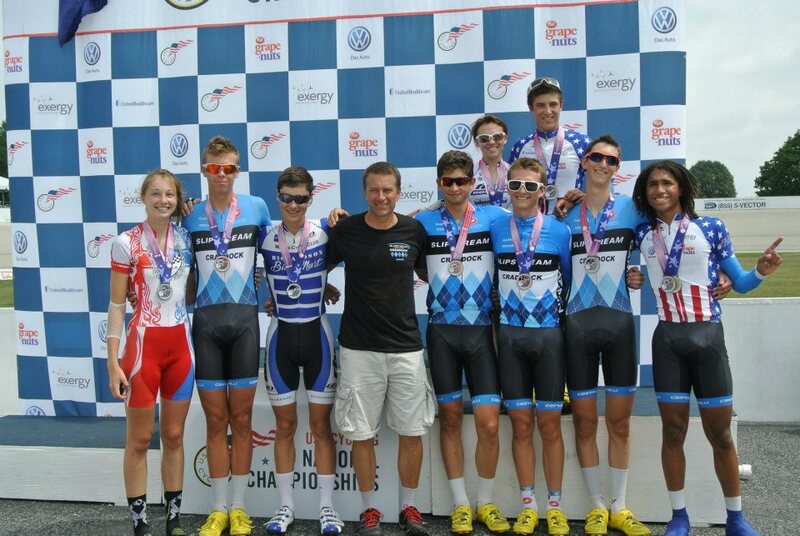 I’ve coached riders to over 100 National championship podiums (we stopped counting) and over 20 gold medals there. I’ve also coached riders to more than 100 State Championships. I’ve coached 15 riders to world championships, including a podium performance there. I’ve had riders represent USA at the World Championships every year since 2007, and this is from someone who isn’t currently on USAC staff, and I’m not a former pro. I’m not politically connected to the inside track of USAC, and while we’ve done well to have many riders in the national program, we’ve also dedicated ourselves to help athletes make it to the elite ranks outside of that program. If you don’t give up, we won’t either. I’ve been head coach at camps in Mallorca, Italy, Belgium and in the US. I’ve been a coach and head coach for the USAC Regional Development Camp. To show that we’re not a one trick coaching operation, I’ve coached riders to the podium and national championship and the national team in match sprinting, and I’ve also had riders complete RAAM and Paris-Brest-Paris. Riders I’ve coached have set the national record in the hour on the track, and one might even have the current world record for juniors. I’ve had riders on the national team for track, cyclocross, mountain biking and the road. I’ve directed Team USA at the Pan American games for road and track. I’ve worked with two juniors from their first road event all the way to the pro ranks, and I’ve coached more than 20 riders to the US National team. At one USA National Talent Camp, I was working directly with 15 of the 28 athletes there. My degrees are in Urban and Regional Planning as well as writing. I’m very near completion of my Masters in exercise physiology, and I frequently attend continuing education and coaching summits with UCI, USAC, and elsewhere. Further, I’ve been coaching full time for 19 years, which brings an education all its own. I’m also a certified teacher in Texas, holding a lifetime certificate. With 6 years in the classroom working with the most challenging of students, issues that athletes present me with, such as emergency work-related trips, a sick child, or a sudden opportunity to join a high level race are all issues we can deal with calmly and proactively. Lastly, I don’t refer to other coaches as “the competition”. There are far more racers than we could ever coach, anyway. I encourage you to talk to any reputable coaches who you think might match up with your wants and needs. Find the best and most comfortable match for you. I have a good working relationship with many coaches across the country. If I’m not the one for you, and we don’t have one who fits what you are looking for, I expect that we can find one who does match up well with what you are looking for in a coach. Please click here to learn more about how Christian and WRA work with an athlete.